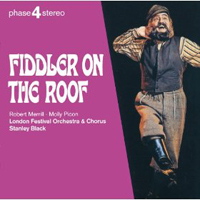 Original London Cast, 1967 (Columbia/Sony) (3 / 5) This is an enjoyable recording if you don’t mind the British accents of most of the singers and the strange, hard-to-pin-down accent of Topol in the role of Tevye. Topol fans may actually prefer his performance here to the one he gives on the film soundtrack album (see below), as it’s less mannered and has more theatrical energy. The other London cast soloists are Miriam Karlin, Linda Gardner, Cynthia Grenville, Rosemary Nicol, Jonathan Lynn, Sandor Eles, and Paul Whitsun-Jones. All are fine but not distinctive enough to warrant special note, except to say that Karlin is an extremely baritonal Golde. 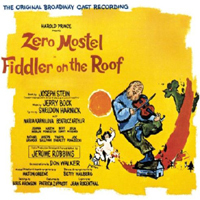 Although the Broadway orchestrations are used here, they intriguingly sound a bit different than they do on the original Broadway cast album, because of the way the score is conducted (by Gareth Davies), recorded, and mixed. — M.P. Studio Cast, 1968 (London) (2 / 5) Here is an odd but intermittently pleasurable recording made in “Phase 4 Stereo.” Aside from overload distortion in certain passages, the sound quality is terrific. Although the orchestrations seem to be the Don Walker originals with a few enhancements, the score sounds quite grand as recorded in a weighty, reverberant acoustic. Conductor Stanley Black sets some very slow tempi, but his pacing does bring out the melodic beauty of “Sunrise, Sunset,” “Sabbath Prayer,” and “Far From the Home I Love.” As Tevye, we have opera star Robert Merrill, who toured in the role and who comes across here as both a fine actor and a great singer. Playing opposite him as Golde is Molly Picon, a treasured artist of the Yiddish theater — but she was too old for the role when this recording was made, and is further hampered by Black’s slow pacing and by having to switch back and forth between octaves to accommodate her voice to the range of Golde’s songs. Still, Picon has many engaging moments. Gary Cole sounds too operatic and too British in Motel’s “Miracle of Miracles,” but Mary Thomas sings Hodel’s “Far From the Home I Love” well, even if she indulges in an ill-advised high note at the end. There is no Perchik to be found here; the character’s “Now I Have Everything” has been eliminated. On the other hand, we get to hear Merrill perform one of the partly sung, partly spoken monologues Tevye delivers upon learning that his daughters are planning to marry against his wishes. The most controversial aspects of this recording are that (1) it features annoying, superfluous narration written by Jacob Kalich and spoken by Picon and Merrill, and (2) for some reason, the order of the first several songs in the score was changed. — M.P. 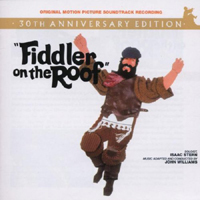 Film Soundtrack, 1971 (United Artists) (3 / 5) Although the film version of Fiddler on the Roof is a pretty good adaptation of the show overall , the soundtrack recording doesn’t stand up all that well on its own. The music was adapted and conducted by John Williams, and the violin soloist is the great Isaac Stern, but many of the vocal numbers fall short as enjoyable listening experiences. 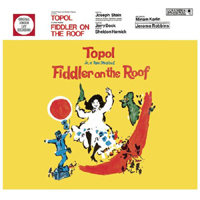 Topol’s Tevye has lots of personality but, again, his odd accent is somewhat disconcerting, as on the original London cast recording. Also, he delivers his spoken lines in “Tradition,” “Tevye’s Dream,” and elsewhere v-e-r-y slowly. Norma Crane seems miscast as Golde, and Michele Marsh as Hodel goes overboard in trying to make “Far From the Home I Love” sound “natural” rather than musically expansive. More happily, when Rosalind Harris and Neva Small join Marsh in “Matchmaker, Matchmaker” it’s a delightful performance. The “Chava Ballet Sequence” is gorgeous, thanks in large measure to Stern’s achingly beautiful solo, and the highlight of the recording is Leonard Frey’s rendition of “Miracle of Miracles” — two minutes and four seconds of utter joy. The latest CD edition of this album includes some tracks that were not on the original two-LP set or on the first CD edition. One of them is “Any Day Now,” a song that was written for Perchik to sing in place of “Now I Have Everything” but didn’t make it into the movie. — M.P. Broadway Cast, 2004 (PS Classics) No stars; not recommended. This production was woefully misdirected by David Leveaux. We can be grateful that the cast album doesn’t preserve such bits of staging as Tevye’s daughters sponge-bathing themselves during “Matchmaker, Matchmaker,” Tzeitel and Motel dangling from the flies during “Tevye’s Dream,” and the minor character of Nahum the beggar taking over the spotlight in every big number. From a purely musical standpoint, the production wasn’t quite so awful, but that’s not to say there’s any compelling reason to purchase the recording. As Tevye, Alfred Molina has a bit more life here than he did onstage, but he’s still bland in a role that requires a tremendous amount of presence, charm, and humor. Sally Murphy, Laura Michelle Kelly, and Tricia Paoluccio as (respectively) Tzeitel, Hodel, and Chava are colorless. Randy Graff is very good as Golde, but it’s difficult to enjoy her performance in these surroundings. And although John Cariani does a fine job with Motel’s “Miracle of Miracles,” Robert Petkoff doesn’t have enough voice for Perchik’s “Now I Have Everything.” Larry Hochman’s rewrites of the original Don Walker orchestrations are completely unnecessary; the fillips he adds to “Tradition” are especially egregious. Conductor Kevin Stites distorts such great songs as “Matchmaker, Matchmaker” and “Far From the Home I Love” with weird internal shifts in tempo. For what it’s worth, the recording includes a fair amount of Joseph Stein’s wonderful dialogue. — M.P. 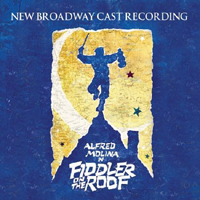 Broadway Cast, 2015 (Broadway Records) (1 / 5) Here we have the cast album of yet another misdirected Broadway revival of Fiddler on the Roof — this one surprisingly botched by Bartlett Sher, whose previous productions of two other classic musicals, South Pacific and The King and I, were excellent. Sher’s ill-considered revamp of Fiddler included the addition of a pointless framing device, with Danny Burstein as a present-day Jew returning to the former site of Anatevka and then assuming the role of Tevye in what essentially became a show-length flashback; and a nonsensically dark misinterpretation of the formerly lighthearted “Matchmaker, Matchmaker” scene and song. Happily, neither of these major missteps come through on the recording. But several other infelicities do, such as the near-ruination through downward key transposition of “Sabbath Prayer” and “Sunrise, Sunset,” presumably done in order to keep these numbers within the narrow vocal range of Jessica Hecht as Golde; fussy new orchestrations by Ted Sperling, incorporating some passages borrowed from the film version of Fiddler; and the fact that Ben Rappaport, as Perchik, lacks the vocal chops for “Now I Have Everything.” (Given the deep pool of performing talent available to Broadway directors, one has to wonder how and why both David Leveaux in 2004 and Bartlett Sher in 2016 cast Perchiks who couldn’t properly sing the character’s one song.) Adam Kantor’s Motel is persuasive in “Miracle of Miracles,” but while Samantha Massell displays a lovely voice as Hodel, her rendition of “Far From the Home I Love” is marred by poor phrasing and jarringly modern pronunciation. Very much on the plus side, Burstein is a warm and vital Tevye despite all the mishegoss that surrounds him. He fully deserved the Tony Award nomination he received for carrying this production on his shoulders, and his recorded performance is primarily responsible for keeping the cast album from being handed a 0-star rating. 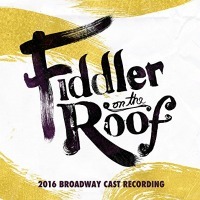 [Note: Although the recording was made and released early in 2016, this Fiddler officially opened on December 20, 2015, hence the date at the top of this review. ]– M.P.